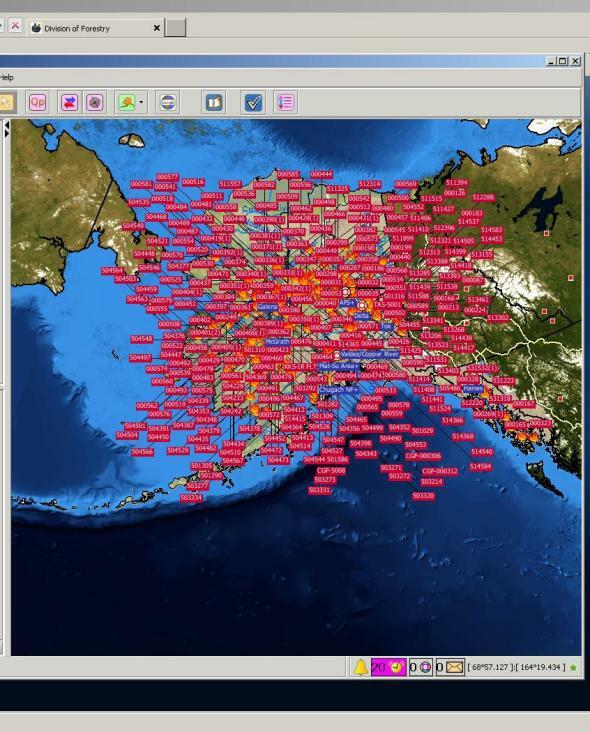 There are so many fires burning up Alaska right now, they don’t even fit on the map. Alaskans can take a peek out the window this week to catch a glimpse of climate change. It seems the entire state is on fire, and those fires are burning up land at a pace far beyond that of 2004, the previous record-setting year. Wildfires in Alaska have burned more than 1.25 million acres so far this year. That’s an area 32 times the size of Washington, D.C.
3,343 firefighters are currently working in Alaska. That’s one-third of all the wildland firefighters currently tasked in the United States. 85 percent of the area burned nationwide this year by wildfire has been in Alaska. The state of Alaska is at its highest level of alert. Its Tuesday wildfire situation report was 65 pages long. And the problem is getting worse: Wildfires now burn five times more acreage each year in our northernmost state than they did in 1943. Since the state is so huge, firefighters are often spread few and far between—and fires that aren’t immediately threatening human habitation are often left to burn. But some of the state’s most densely populated areas, like Fairbanks, are seeing an especially pronounced fire boom. Several factors are at play: For instance, there is more fuel (trees, grass, etc.) to burn, thanks to fire-suppression policies, and human-sparked blazes are on the rise. And, of course, it’s all compounded by the climate trend toward hotter and drier weather. Last year was Alaska’s warmest on record, and last month was its warmest May by far—more than 7 degrees Fahrenheit above the long-term average. Alaska now sticks out like a bright red sore spot on world temperature maps. That remarkable warmth has set the stage for a remarkably disastrous fire season, melting off this year’s meager snowpack and turning vast tracts of forest into kindling. Global warming has helped spark big wildfires in Alaska. 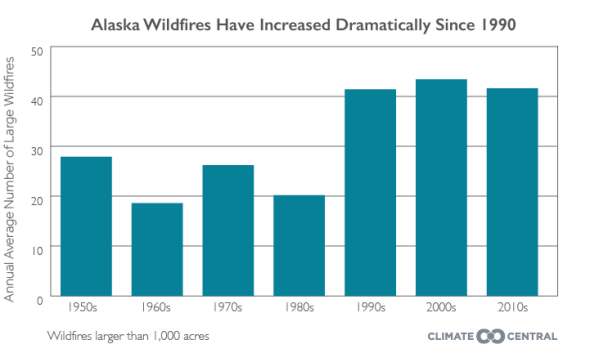 A new report by Climate Central shows that Alaska’s fire season has lengthened by 35 days since 1950. 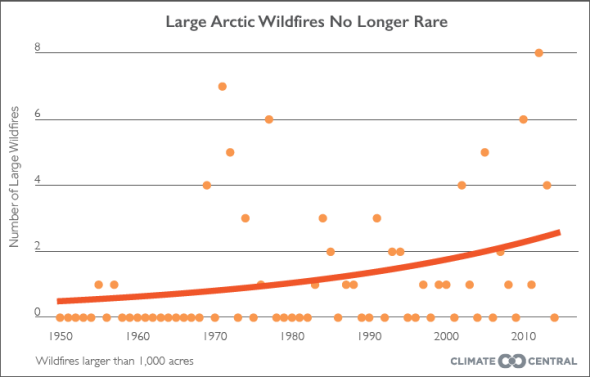 That’s increased the chances for huge fire seasons like this year’s—in which fires are increasingly burning through the permafrost itself. That means Alaska is on the verge of tipping from a net sink of greenhouse gases to a net source, setting off a spiral: Global warming begets more fire begets more global warming. As I reported in a lengthy dive on Alaska’s rapidly changing climate earlier this year, a cruel irony is that since Alaska’s wildfire-fighting service is funded by the state’s significant oil reserves, a dip in oil prices this year means the state is attacking this record-setting fire season with fewer resources. And it’s not just Alaska. If you broaden the view to all of North America, vast stretches of northern Canada are also on fire at the moment—including the area around the Alberta tar sands oil fields. A huge plume of smoke has stretched as far south as Arkansas, reddening sunsets and producing eerie views of the moon across the Midwest in recent days. Even north of the Arctic Circle, large wildfires are becoming more common—even burning through tundra and permafrost. Data from the Canadian Interagency Forest Fire Centre shows nearly 3 million acres have burned so far this year in Canada—also far above long-term averages—with the Northwest Territories, Saskatchewan, and Manitoba at the highest level of alert.